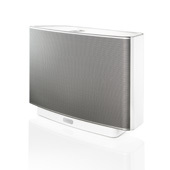 SONOS PLAY:5 is the original, bigger room, bigger sound, all-in-one Sonos player. 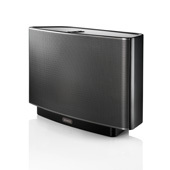 It's a powerhouse of sound with five integrated speakers and five digital amps. Stream all the music on earth wirelessly in any room and control it all with free apps for your Android™, iPhone® or iPad®. Five integrated speakers powered by five dedicated digital amplifiers (two tweeters, two mid range drivers and 1 subwoofer driver) provide crystal-clear, room-filling sound that rivals much larger, more complicated audio equipment. No rewiring. No complex programming. Simply connect a SONOS BRIDGE or PLAY:5 to your wireless router and link all your Sonos players wirelessly with one touch.